Kathleen Weber’s journey to professional baker has been a series of happy accidents. 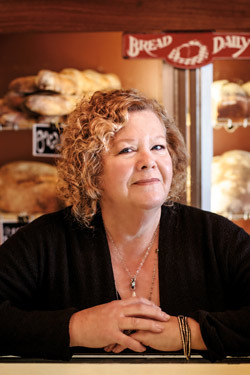 From its humble beginnings in her home kitchen to the tables of the acclaimed French Laundry, she and her husband, Ed, and son, Aaron, have grown Della Fattoria into a bakery of national renown, named one of the top 10 in the country by Bon Appétit magazine. 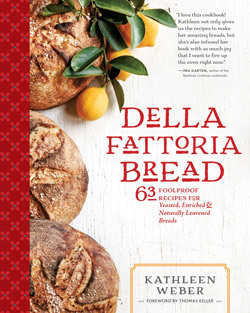 In her forthcoming book, Della Fattoria Bread: 63 Foolproof Recipes for Yeasted, Enriched & Naturally Leavened Breads, Kathleen shares some of the bakery’s most cherished recipes (like their Meyer Lemon-Rosemary Campagne), along with words of wisdom to empower home bakers. Since 2002, CUESA has been proud to have the Webers in our market community, selling delicious handmade loaves from their Petaluma-based bakery. Kathleen gave us a sneak peek at the book, which hits the shelves next Tuesday, and shared some of her thoughts about the art and craft of baking. CUESA: What initially drew you to baking? CUESA: How did you go from home baker to professional baker? KB: It was not a planned event. I was baking more than we could eat, so we were giving bread away. My son, Aaron, was cooking at the Sonoma Mission Inn, and they ordered our bread for an event, and after that they picked it up in their restaurant. As soon as that happened, we had to change the way we were doing things. I had to get a bigger mixer and some actual equipment. The next account was at French Laundry in 1995. It was a very fast-paced, life-changing moment. Then we started selling at farmers markets, which has been huge for us. There’s no point in baking bread if someone’s not going to buy it and eat it. For us, being able to get to know our customers and have that connection with them is astonishingly important. We actually think about the people we’re baking for. We know faces and names, and we know what they like and don’t like. They’re a very important part of our process. CUESA: Why has it become important to preserve the craft of bread-making in our modern world? KB: The bakery and café where we bake our pastries used to be one of about half a dozen bakeries in downtown Petaluma. The little 30,000-population town would come into those bakeries and pick up their bread as part of their day. When mass production of bread and cookies started in this country around the time of the Second World War, it became obvious that something was lost. There was a time when convenience was so exciting to people that they were happy to take the reduction in quality. Later, college kids started traveling the world and seeing people baking on a smaller scale in villages. They saw it as something we just didn’t have at home. In the 1980s, Steve Sullivan started playing with bread at Chez Panisse. There wouldn’t have been a Della Fattoria without Acme Bread Company. There had to be that little revolution. CUESA: Talk to us about the importance of good flour in baking bread. KB: Bread is of the most humble ingredients—just flour, water, and salt. In the book, there’s a story about one of our local restaurateurs who tasted my bread in my early days of baking, and she said that she thought it was delicious, but the flour was terrible. She ordered me some from one of her vendors, and I immediately saw the difference in the flour, so we started sourcing it where we could. At the time, there weren’t so many options for the home baker, but Giusto’s in South San Francisco was willing to sell small quantities. Over-processed flour is lacking in flavor and performance. There were great, well-intentioned scientists who wanted to feed the world and started developing strains of wheat that were more tolerant to droughts and floods, but in the process, the overall quality of mass-produced wheat has gone down the tubes. It’s become something that is higher in gluten, more difficult to digest, and different to bake with. By using organic flour we were able to avoid some of those over-processed products and access older strains of wheat. CUESA: Baking bread can be intimidating for someone who hasn’t done it before. What advice do you have for beginning home bakers? KB: I think there’s a way that people look at bread that makes it seem daunting. It’s something their mothers didn’t do and it seems like too much trouble. Maybe it is the timing that gets people distressed about it. It’s important to remember that there’s active time and there’s resting time, when you’re waiting for the bread to do its work. In the book, we describe ways to bake bread that reveal that it’s just a matter of a little planning. Baking bread is not rocket science, and the alchemy behind it is pretty exciting. It feels magical. It’s a thrill to take that baked loaf out of the oven. That’s why I have that John Lennon quote in the back, “After I had made the loaves, I felt like I had conquered something.” It just seems like such an incredible accomplishment. It looks beautiful, it smells amazing, and it’s kind of an astonishing thing to pull that out of your oven. 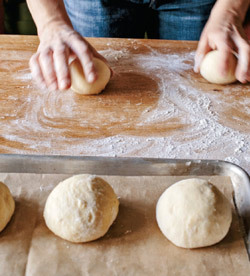 CUESA: What’s one tip you would give someone who’s just starting to bake? KB: One of the biggest things is using a scale, not a measuring cup. Once people get comfortable doing that, they say it’s so much easier and more accurate. CUESA: Why is it important to know your baker? KB: Knowing your baker is like knowing your farmer. When you’re getting something off the grocery store shelf, try to think where it’s been and how many hands have touched it. Maybe it’s only been touched by machines until it was packaged. But when the person who baked a loaf of bread hands it to you, it’s a big deal. It’s so much more personal. And it should be, because food is personal for both the baker and the buyer. Try Kathleen’s recipe for Della Panzanella. Visit Della Fattoria’s stand on Saturdays at the Ferry Plaza Farmers Market. See Kathleen speak tomorrow at Book Passage and at the Commonwealth Club on Tuesday, October 14, or visit the bakery with CUESA on November 7. Photos from Della Fattoria Bread by Kathleen Weber (Artisan Books). Copyright © 2014. Photographs by Ed Anderson.